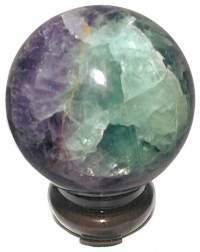 Mostly Purple AA Chinese Fluorite 70mm or 2 3/4" Spheres have superb deep purple hues with small areas of clear and green Fluorite. 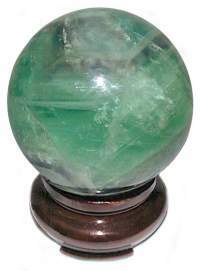 China is the best source for quality Fluorite spheres which are now exceedingly rare. Fluorite plucks order from the heart of chaos, it provides a stabilizing energy which helps relationships and individuals to flourish. The Rosewood Ball Stand is sold separately. Lovely AA Chinese Rainbow Fluorite 72mm or 2 7/8" spheres have a colorful mix of purple, clear and green hues in captivating, translucent crystal formations. Named for the Latin verb 'fluere' meaning 'to flow', Fluorite has a cleansing, fluid quality used by crystal masters to clear both physical and mental energies. The Wood Sphere Stand is sold separately. Excellent 75mm AA Rainbow Fluorite 75mm or 3" spheres from China have light and deep banded rainbow coloring in zigzag and honeycomb crystal formations. Crystal masters use Rainbow Fluorite to promote the drive toward physical self perfection. The Oriental Rosewood Stand is sold separately. 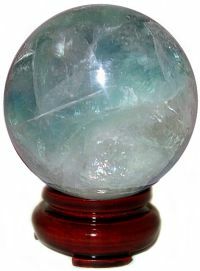 Beautiful AA Chinese Rainbow Fluorite 80mm spheres have good clarity and a variety of purple, green and icy clear hues with phantoms and interesting honeycomb crystal formations. Fluorite plucks order from the heart of chaos, it provides a stabilizing energy which helps relationships and individuals to flourish. 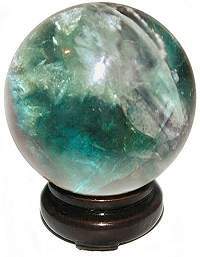 China is the best source for quality Fluorite spheres which are now exceedingly rare. The Oriental Rosewood Stand is sold separately. 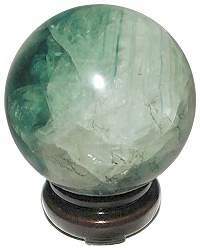 Highly unusual Green AA Chinese Fluorite 75mm or 3" Spheres have great clarity with an artistic mix of deep green coloring and icy green crystals are loaded with phantoms. Fluorite plucks order from the heart of chaos, it provides a stabilizing energy which helps relationships and individuals to flourish. The Oriental Rosewood Stand is sold separately. 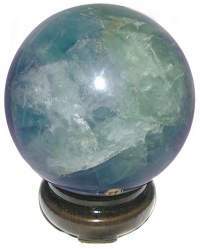 Rare Blue Fluorite 90mm spheres have great clarity with some green or purple coloring. Blue Fluorite has an exhilarating energy that plucks order from chaos and helps relationships and individuals flourish with an attunement that is beneficial to both. The Oriental Rosewood Stand is sold separately.